The origin of the queen who became a child-eating witch goddess fated to battle Barong, the King of the Spirits, for eternity. When my husband, the king, died, his people began to call me Rangda, which means “widow.” As if my entire life should be reduced to the loss of a single thing, namely a feckless spouse. It’s ironic that my name would be tied to him for eternity, for he cast me aside to marry another woman. Was I even still officially his wife? Ours had been a strategic alliance to unite two kingdoms. I was born Mahendradatta, princess of Java, and when I came of age, my father arranged for my marriage to King Udayana and shipped me off to the neighboring isle of Bali. I never let silly romantic fantasies enter my mind. As a royal, I had a job to do, a responsibility to my people. As a queen, though, I didn’t have much power. My marriage would politically tie Java to Bali, and that was all that was required of me, aside from making sure I provided heirs. All over Bali, you’ll see statues of me holding innocent babes, the instant before I devour them. Try not to judge me too harshly. If I am to act as a profane foil to all that is sacred, I must corrupt that which is most holy. But I craved power; I yearned to be strong. Hindus have hundreds of deities, but the one I focused my prayers on was the goddess Durga, whom I had always emulated. Such a strong woman, a fierce warrior, her many arms clutching weapons, riding upon a snarling tiger. Yes, this was who I wanted to be. I had few options. With little power of my own, I decided to harness the strength of others. I turned to witchcraft, learning how to control demons, those dim-witted ground-dwellers, to do what I demanded of them. If someone displeased me, I would inflict a horrific illness upon them. At last, power coursed through my veins, an intense, almost orgasmic feeling. And before I knew what was happening, his guards had grabbed me and dragged me out of the palace, abandoning me in the dark jungle amidst the screeching of monkeys. I had only the clothes on my back. No food or supplies. A woman left exposed in the wild — Udayana assumed I would soon die, and everyone could forget all about me and the shameful fact that I had corrupted this island with the introduction of witchcraft. The nocturnal sounds of the jungle filled my ears. I could hear animals moving stealthily through the foliage, stalking their prey. But I was no weak woman. I called upon Durga and the demons to protect me. After a week or so, some villagers had learned of my exile and went into the jungle to seek me out. They heeded the alluring call of the dark arts; they wanted me to teach them how to enslave demons. Bitter souls who wanted to curse others, who wanted to spread sickness among their enemies. These were my first students, my first leyaks, or witches. No longer the Queen of Bali, I became Queen of the Leyaks, and eventually, Queen of Demons. One of the demons I used to spy on the court returned one evening, slithering along the ground to inform me that my husband planned to remarry. Fury filled my breast. Who was Udayana to replace me, the mother of his children, the woman who brought his son, Erlangga, the king-to-be, into the world? I screamed in rage, a horrific cry that wilted the plants around me and sent the animals scurrying away in fright.Trembling with anger, I sent a message to Erlangga to meet me at the edge of the jungle. I saw the prince sneaking down the path for our illicit rendezvous, his eyes darting in every direction, worried he might be seen. “My son, my son,” I called, a whisper that carried on the wind to his ears. “Mother,” he said, looking at the ground. He would not meet my eyes. “I cannot,” he said after a time. “I cannot.” Erlangga turned from me and fled back to the palace. If he had looked upon me — by this time I was a rather frightening sight, unbathed, my clothes in tatters, my hair matted — things might have turned out differently. But it seemed Erlangga feared his father more than he feared me. That would be the biggest mistake of his life. On top of my firstborn’s betrayal, I learned that my daughter, Princess Ratna Menggali, a young maiden known for her loveliness (this is not just a mother’s pride speaking), couldn’t find a single suitor. No one of high caste wanted to marry a daughter of mine. My association with witchcraft had tainted my poor daughter. I found Ratna running through the jungle in tears, not seeming to notice or care about the branches that scratched her beautiful face. I gathered her to me and held her against my chest. Ratna became my pupil, one of my most powerful leyaks. “We shall make them pay,” I told her, seething at the wrong we had both suffered. A young girl from the village wandered too far into the jungle one misty morning, and Ratna snatched her and brought her to me. While the child trembled and sobbed in fear, I dragged my claw-like nails across her throat. “Take this innocent blood as an offering, Durga, O Invincible One!” we chanted. The goddess heeded our call. The sea rose in a rush of water, a black tide that flooded the entire village. The crops became unharvestable, homes destroyed. The success of the sacrifice sparked an idea. On Bali, babies are holy, for they have only recently left the spirit realm. In fact, for months, the Balinese do not let their newborns even so much as touch the ground. For that, you see, is where my minions must stay. Demons are relegated to the dirty, profane earth, where only the filthiest of body parts, the feet, should touch. Whenever we learned of a child’s death, I would send Ratna and the other leyaks on a mission to dig up and steal the tiny corpse for our black rituals. My patron deity Durga, pleased with my drive and my devotion, granted me immortality and full dominion over the demons. I felt as if I were on fire, as my mortal essence burned away. I had become a goddess. One day, years later, I learned that Udayana had died and Erlangga was now king. I refused to forgive him for not defending my honor. He had abandoned his own mother and he would pay the price. Erlangga knew of the danger of my wrath. 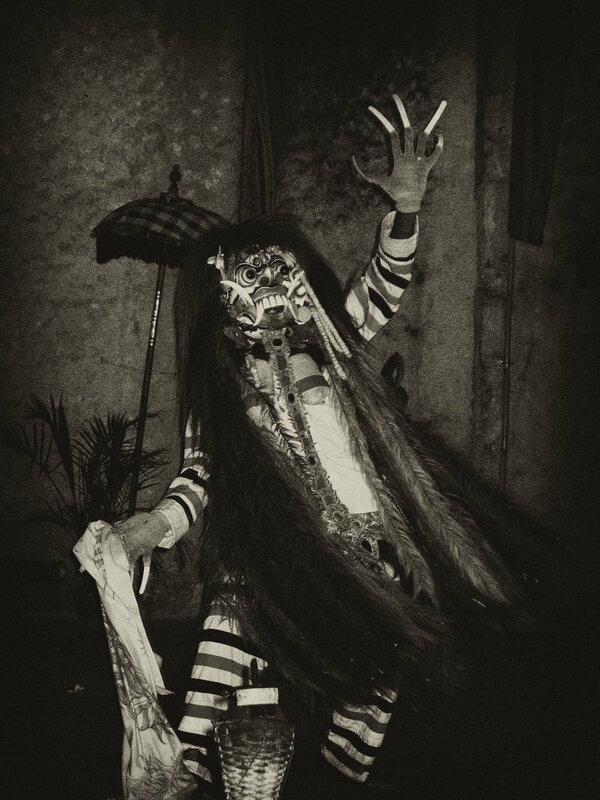 Reports of desecrated graves had spread, of a wild woman of the jungle and her pet demons, which wreaked havoc on the people of Bali. While my son mustered an army to fight me, I sent a foul plague creeping throughout the kingdom. Within days, half of the population lay dead. Erlangga fretted. What chance would mortal men have against a goddess and her army of witches and demons? My son called upon Empu Pradah, a legendary holy man, and asked him how to defeat me. He was told to seek the aid of another god, Barong, the King of the Spirits, a mighty shape-shifting beast. He sometimes takes the form of a boar, sometimes an elephant, sometimes a tiger — though the lion guise is his favorite. Barong ambles along clumsily. But don’t let that fool you — when it comes time to fight, he becomes as fierce as any of my demons. People don’t like to think of him as a monster, but that’s what he is. Erlangga’s army approached, carrying wavy silver knives called keris, the tips coated with poison. Let’s give them a taste of their own medicine, I thought. All of the soldiers were suddenly consumed with an overwhelming desire to turn the keris upon themselves, to commit suicide by stabbing the toxic blades into their own hearts. But just as the daggers were about to pierce their skin and become inflamed with the poison the soldiers meant for me and my demons to suffer, Barong reared up and cast a counterspell. Instantly, the skin of Erlangga’s soldiers became impenetrable. The keris were deflected. The army was saved. My frustrated shriek caused the men to cover their ears, to tremble in fear. But I had gone. For, you see, a realization had dawned on me, like a bright light piercing the darkness. This was my role for eternity: Barong and I were to engage in a never-ending battle. Neither good nor evil could win. Of course, Barong’s battle is seen as necessary. The Balinese love him. He is their benevolent hero. His violence is forgiven, while mine is reviled. So be it. The minute we are done battling, Barong is back to his docile self, lumbering along like a puppy dog. He knows how to play to his audience. By the time I had gained immortality, I had become an old woman. I let my hair grow long and wild; it became a mass of tangled white strands, some matted into dreadlocks. For the most part, I stopped bothering to wear clothes — what was the point? I was a fearsome deity. My breasts drooped farther and farther, until they swung across my stomach when I snarled. My teeth continued to grow as well, forming fangs that curved outward like a boar’s. I let my fingernails lengthen until they were razor-sharp claws. And I stretched out my tongue to demonstrate my insatiable hunger. A sense horror overwhelms all who see me. People call the spirits over which I reign “evil.” But do you feel evil when you are consumed by grief or pain? Is it evil to feel fear or hopelessness? To be sick? Unloved? I quickly realized that without my army of so-called evil demons, people would not realize the joy brought about by my counterpart, Barong, and his legion of spirits. The world must remain in balance, and I must do my part. Do not wish for a paradise. Utopias are dull places, for how can you know what happiness is if that’s all there is? How would you know peace without there being stress to escape from? Paradise, as humans naïvely imagine it, is the epitome of boredom, not pleasure. Does this sound strange to you? It is no more strange than the fact that Christians pray to a demigod dying in agony. There, too, you have the balance of good and evil. Perhaps I am wrong about the Balinese. Perhaps they do realize I have an essential part to play.